Sending happy Valentine’s Day wishes to all of our readers today! Our gift to you? These great project ideas from Jerusalem Greer of Jolly Goode Gal. Which ones will you be trying? I have a confession of the heart that I cannot hide anymore. Can you guess what it is? Yep. I Â confess, I love and adore Valentine’s Day. Â Not because of the romance (though I never turn my nose up at romantic gestures that happen to coincide with February 14) and not because of the chocolate (although that doesnât hurt either). No, my affection for what cynics refer to as a âgreeting-card holidayâ stems from this: Valentineâs Day is simple. V-Day is a day that comes to us in the middle of winter, when there is not one colorful thing in bloom, when the skies are gray, and the temps are chilly, and brings us bear hugs, giant red foil wrapped candies and the cheerful happy colors of conversation hearts. Simple joys and small kind gestures, that is what makes Valentineâs Day lovely to me. After all, isnât L-O-V-E Â what makes the world go round? To spread V-Day cheer, here are a few of my favorite Valentine’s Day crafts. Some I have done and some are on my still-to-do list but all are happy, vibrant and the perfect antidote to the winter blahs. I adore maps. I have a fairly large collection of vintage maps and globes. How cute and easy would this be to make using old atlas or travel maps? Make it large or small, a poster or a card, but make one and pass it on to someone who needs an extra little boost. How cute are these ribbons? Everyone is a winner with these adorable creations. Cupcake liners, paper hearts and craft ribbon combine to make adorable Valentineâs Day prize ribbons. Not just for fashion, these ribbons would be the perfect way to embellish Â a box of chocolates, a simple greeting card or a small bouquet of flowers. Looking for a creative way to pass on V-Day greetings to co-workers and friends? Â Try this âRoll With Itâ candy-gram. In addition to Rollo you could also use Tootsie Rolls or Fruit Roll-Ups for kids. All you need to know is this: Felt Heart Garland. Need I say any more? Whatâs not to love? This is a great craft that keeps on giving. Our family has done this the past few years and we all love it. Each family member has his/her own mail box. Near the mail box and all around the house there are little stacks of note paper and colorful pens. We all write each other little love notes and hide them in the mail boxes, raising the little flags when a delivery has been made. Sometimes the notes are serious, sometimes they are silly, always they are special. I have always loved the look of red heart playing cards mixed in with Valentine’s decor (perhaps it has something to do with Alice in Wonderland?) and have used them in a variety of ways over the years to accent my V-Day crafts. I love this garland that combines the hard straight lines of the playing cards and with the soft scrappy bits of fabrics to create an adorable accent piece. 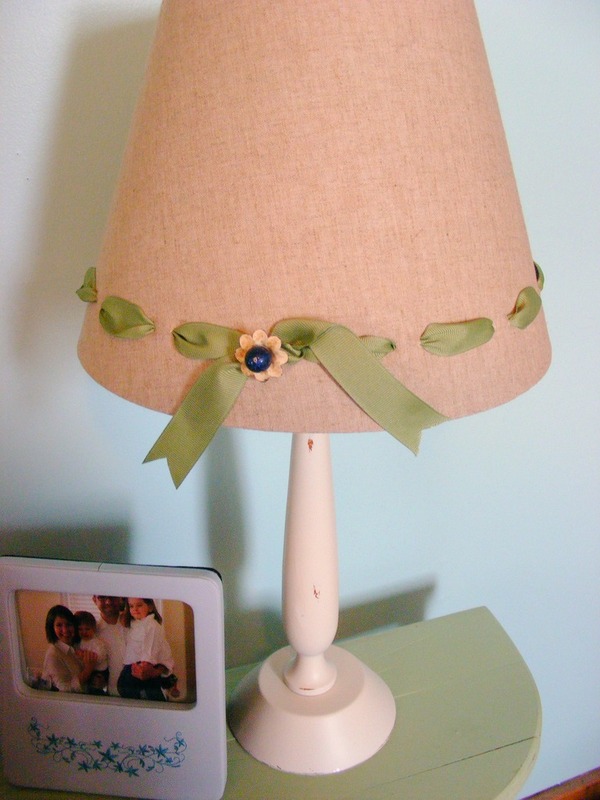 Ever since I found my first vintage lampshade frame on the side of the road and sufferedÂ extremeÂ sticker shock at the cost to get it recovered professionally, I have been looking for easy andÂ inexpensiveÂ ways to dress up the plain (and may I say, boring) lampshades that are more budget friendly. A few years ago (my how time flies!) I decorated a guest room and playroom for a favorite client. Because Liz is an amazing chef, I chose the theme of a “sweets shoppe” for the playroom. 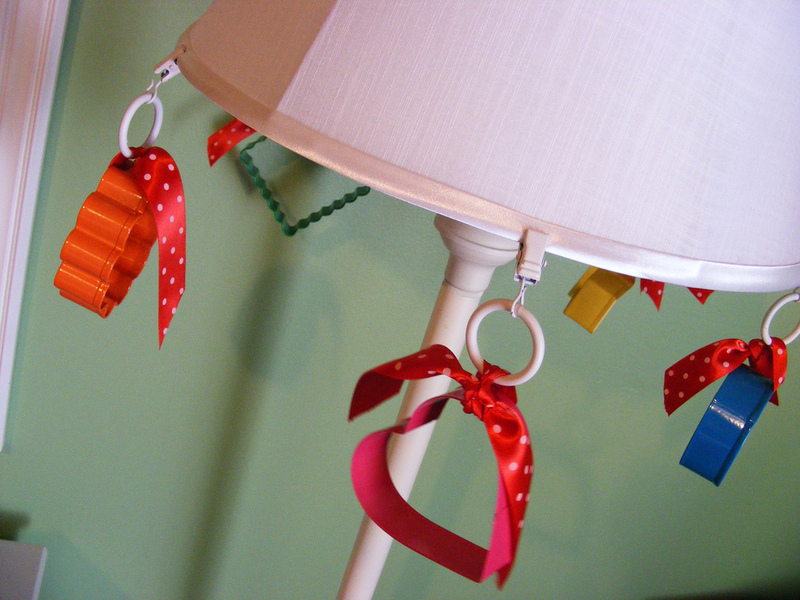 ToÂ embellishÂ the plain Wal-Mart lampshade, I used clip-on curtain rings, ribbon and metal cookie cutters in fun colors. Â The look is playful, cheery and easily changable as the grandchildren grow. Vintage burlap shades are some of my person favorites, but too often they can look dull and fuddy duddy on their own. I have taken to attaching oversized silk flowers to mine using hat pins. I often change out the flowers seasonally, and sometimes I even replace them with other fun objects- paper pinwheels in the summer, felt leaves for fall… By using hat pins I can change the look easily and quickly without damaging the shade. 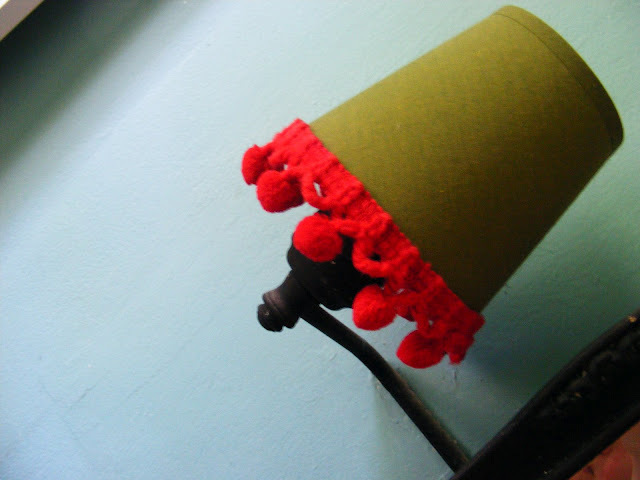 Ball fringe and a hot glue gun can be a huge asset to any lampshade, especially small ones.Â Because I only had small scraps of this vintage fringe, I wasn’t if I would ever find a use for them. 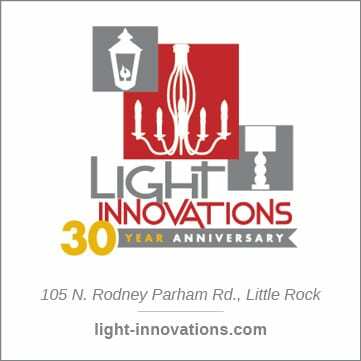 Then I remembered these smallÂ chandelierÂ lampshades that I leftover from another project. Together they added a great bit of drama and color to a small powder room. 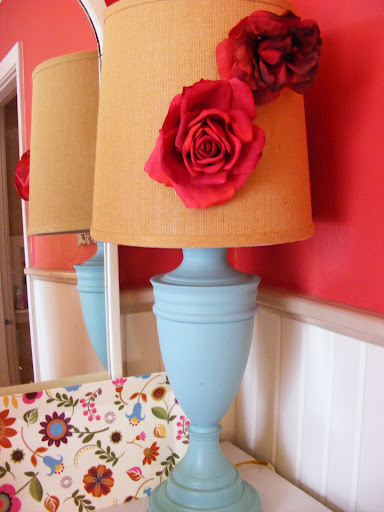 Paper shades can be the plainest of the plane when it comes to lampshades. Luckily a single hole punch, some ribbon and a great vintageÂ buttonÂ can solve that problem. 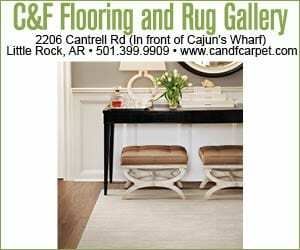 To create a clean and sophisticated look, make sure to measure and mark before you punch. On this lampshade, I used my fingers as my guide.Â My pattern was 1 finger space apart/punch then two finger spaces apart/punch. Using a pencil I marked off where each punch should go before getting started. If you areÂ nervousÂ about trying this. Wrap a piece of paper into a cone shape and practice measuring and marking your pattern. 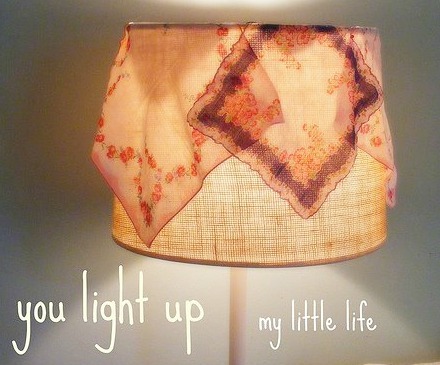 Those are just a few of my ideas of how to easily light up your life with some inexpensiveÂ embellishments. Â Thank you for lighting my life up by letting me share these crafty tips with you today!